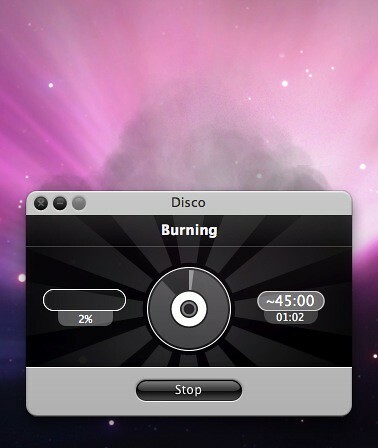 Disco is a polished (from the UI perspective), inexpensive (USD 29.95, currently 10 dollars off as of 13 May 2009) alternative to Toast Titanium. I’ve had mixed results with Toast, and did not want to pay the upgrade fee, so I started looking for alternatives. I’ve done a few burns in Disco so far, and it seems to work quite well. No problems or “coasters” yet, at this time. Disco supports spanning of a backup set to multiple discs, and lets you know how many discs you will need to complete the backup. Very convenient, and you just feed it the disc media when prompted, while it works. Disco stores a discography for created media or disc images, so you can easily search for files on your media. Straightforward workflow, assisted by what the publisher calls “Crossroads” technology. It’s unnoticeable, and I had no problems following, so in a way I guess it works! Creation of CDs or DVDs with Hybrid, HFS+, UDF, PC Joliet, or ISO 9660 file systems, which means you’ll be able to read the media most anywhere. Burn to all Apple-supported in- and external drives, and enjoy CD multi-session support, burn and erase for rewritable media, and support for dual-layer DVDs. If your audio is supported by Quicktime, you can create an audio CD or easily switch to a MP3 data CD. Also, you can drag-and-drop to change track order. You can create disc images from files and discs in the CDR, ISO or DMG formats, as well as create CDs from ISO, DMG, IMG or CUE/BIN. Oh, I almost forgot that it “smokes” when you burn, provided a new-enough Mac. Pretty cool effect! I used Disco for a few burns (the demo allows you 7, gratis), and I found the program to be a tad buggy here and there. There’s times where restarting Disco will help it detect discs, or, where it mis-detects the burner you want to use. I have a San Disk Cruzer USB stick, which for some reason Disco thinks is a burner, and it gets “stuck” on it until I go into Disco Preferences and change it.